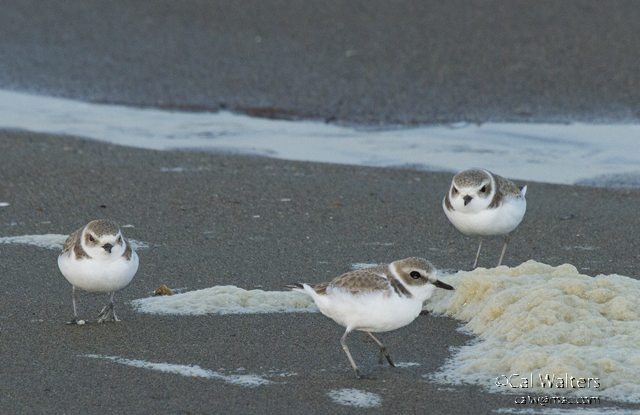 Snowy plovers forage along the tideline, using their excellent eyesight to hunt for small invertebrates. Photo by Cal Walters. 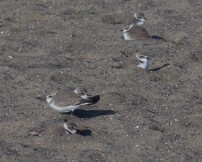 Lately, the favorite part of my day has been monitoring some wintering western snowy plovers that came to Crown Beach in November. Their appearance was first noticed by some volunteer birders who were doing the annual shorebird count around San Francisco Bay. The sand restoration project, which brought nearly $6 million worth of sand dredged from the bay floor around Angel Island and pumped from a barge onto the beach, was just finishing up. The new darker sand, heavy with bits of shell, must have attracted the small flock of plovers. Their favorite winter habitat is a stretch of sandy beach backed by dunes, exactly what Crown Beach offers. That’s also their favorite nesting habitat, which is part of the problem and one of the reasons they’ve been listed as a “threatened species” under the Endangered Species Act. In 1993, it was estimated that only 1,500 snowy plovers remained in the Pacific Coast population due to habitat loss and predation. 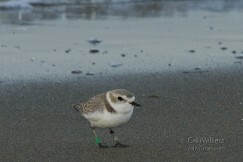 By identifying the bands on this snowy plovers legs, its movements could be tracked over nearly five years. Photo by Cal Walters. For a two-ounce bird that would fit in the palm of your hand, there are many threats they overcome to survive even the average lifespan of three years. Their main survival strategy is concealment, hiding in plain sight. The bird monitors and I have stood with binoculars and scopes and counted the visible birds multiple times, only to find we’ve overlooked one or more. Their camouflage helps them hide from predators such as gulls and ravens. Unfortunately, these predators can decimate the nesting site once it’s discovered. Last year, the South Bay salt ponds hosted the majority of Bay Area nesting snowy plovers with 174 nests. SFBBO discourages California gulls from nesting on nearby habitat to help the snowy plovers.They also improve the nesting habitat by adding oyster shells to provide better camouflage elements for the adults and chicks. Snowy plovers camouflage with the sand, making them difficult for predators to find them. Photo by Cindy Margulis. Wildlife agencies are trying to balance the mandate to return the salt ponds to tidal action and preserving a portion of them for plover and least tern nest sites. The hope is that with habitat preservation, restoration and predator controls the snowy plover population will return to sustainable levels. Success will be achieved when the snowy plover population reaches 3,000 birds and is maintained over the course of at least 10 years. You can help these threatened birds survive by not disturbing birds resting or nesting on beaches. You can also report banded snowy plovers to SFBBO on their website to help them learn more about snowy plover survival rates and movements.